Amazing work, that scene in Rebels was tense. Funny, the title is exactly what I said upon first glance of the thumbnail. I even made a gravely voice, heh. *Jar Jar appears out of nowhere* Annie? Vader was badass. As usual. Great picture! The moment when you realize, that Anakin Skywalker, with his playful boyish charm, is no-longer exists! Can I use this in a film I am making? Is this entirely your work 100% or nah? Well, it's art of a scene from the TV series Star Wars: Rebels so... idk. That season finale was epic! If Ahsoka hadn't left him, would Anakin have walked a different path? Could she steer him away from the dark side? Questions that I kept thinking about. Ahsoka looked like she truly felt guilty for not being there for Anakin when he needed her the most. What do you think? You see, the difference between Ezra Bridger and Anakin Skywalker, despite their similar backgrounds and personalities, is that Ezra has a surrogate family in the Ghost crew, one that will steer him right when he is in the wrong and encourage him when he is in the right. Anakin...was often given the cold shoulder by most of the Council, Obi-Wan wasn't really emotionally supportive, and he had to keep everything a secret, especially his marriage, which enabled Palpatine to prey on him. Besides, Ezra really didn't fly into a psychotic rage when he learned of his parents' deaths- Anakin did. This was due to him being able to confide in and being comforted by Kanan. Obi-Wan would have spouted some Jedi Code drivel which would not have helped at all. This was an epic season finale. That part was so freakin amazing! I completely lost it when I watched this last episode of Season 2.. Even for me.. This potentially one of the most iconic images in Star Wars history. Was quite surprised how Vader started to act when he was able to see ahsoka with his own eye. There still is a good man buried beneath that suit but the fear of sidious is too great for him to leave the dark side. 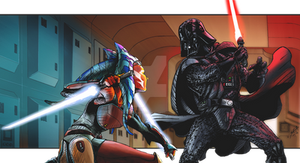 I don't actually think that Ahsoka was really able to bring any of the good from Vader; his sights were definitely set on her destruction from the moment their duel began all the way through to the end. I do feel it's possible that she made him just slightly susceptible to moving back towards the light however. Also, I'm more inclined to believe that Vader's entanglement in the dark side is more based off of his guilt and hatred of his former-self rather than fear of sidious. You are correct- it is based on his intense self-loathing and guilt. Hence why he keeps telling himself that "Anakin is dead, only Vader remains", and why he tries to destroy any trace of his past, including Ahsoka and Obi-Wan. Only his son, who represented the future in the light and the love he still bore for his family, was able to pull him out of the darkness, and even that was a close-run thing. Were they though he was after offering her a chance to join him even making a promise that the emperor might forgive her and allow her to join their ranks. If Vader was so content in killing her he wouldn't have even bothered making the requests he would have just exchanged a few threats and engage her in combat. Instead he gave her that choice so while it was not a major tug for a brief moment we saw a bit of the good man he once was. As for the last part it could just be a mixture of both. That was Sidious's original order, to see if she would reveal any information about the remaining Jedi. And given that Vader didn't try too hard to figure that out beyond just simply asking her, I feel like he just wanted to kill her. I hope he killed her. It sound dark but i kinda wish he had, it would be a good ending to Ahsoka's story. Best. Scene. Ever. Of all time. "Oh, yes, one more thing....Mwah-hah-hah-haaaaah. Thank you." -----Darth, being humorous. Did anyone see that Vader hesitated when Ahsoka said that she wouldn't leave him? One day he will betray Emperor Palpatine and save Luke Skywalker in exchange for his own life. There was always at least a little good in him even at his darkest. Also, see my journal on my response to the finale.